Red Scooter - SHIPS FREE! This scooter is manufactured by Shoprider. 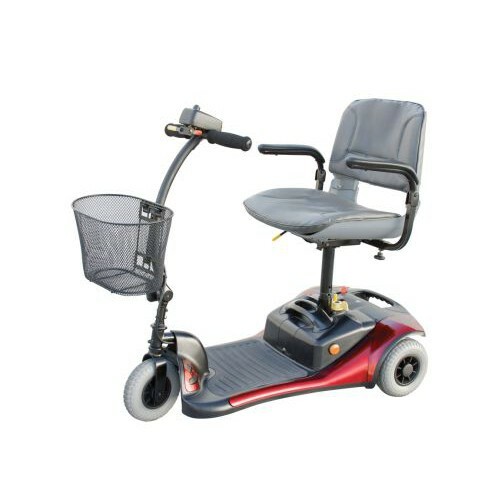 It features a quick-disconnect system that makes disassembly effortless and is ideal for a person who is on the go. This scooter can disassemble into three parts and the heaviest parts weighs only 26 pounds which makes transportation and travel easier than ever before. It comes with a basket, allowing the user to store items for convenience while giving them the freedom to move around and use their hands. The Dasher 3 is available in one color, a delightful burgundy that compliments the style exterior and design of the scooter. This scooter includes 2 batteries, a seat, a charger, a basket and 3 tires. The two batteries are 12V12Ah batteries that each weigh 11 pounds or 22 pounds total. These batteries need to be fully charged before using your scooter for the first time, which can take up to 12 hours. Charging the battery fully will help ensure that the battery has a longer life and doesn’t lose any storage space. The battery needs to be charged fully before going outside or traveling long distances. It is best to keep the battery fully charged at all times, even when the scooter is not in use. If the battery is not charged fully, it runs the risk of permanently losing space, making the battery life shorter. The seat that is included with the Shoprider Dasher 3 is a stadium style seat. It has a width of 18 inches and a height of 14 with a depth of 16 inches. The seat is available is a black vinyl that is stylish yet convenient to the user. It offers a quick and easy cleanup if any food is spilled or gets on the seat. The weight capacity for this scooter is 250 pounds and only one person should be on the scooter at a time. If more than one person is one the scooter and it exceeds the weight limit there is a risk of the scooter tipping and becoming damaged. When one person occupies and uses the scooter they can be ensured that the scooter doesn’t run the risk of tipping over. The battery charger is a 2 amp off-board charger that lets the batteries charge fully. The basket is a wire mesh basket that lets the user place and stow items inside without having to carry and lug them around. The three tires are solid black tires that give the rider a safe and bumpy-free ride when they go outside. This scooter includes a warranty. The frame of the scooter has a limited-lifetime warranty while the electronics and the drive train of the scooter have a 12 month warranty. The batteries have a 6 month warranty. Not what you were looking for? 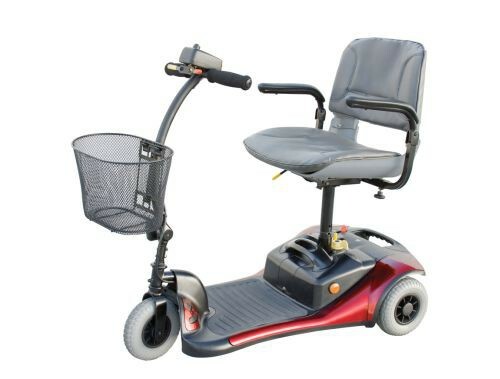 Check out the Shoprider Sunrunner 4 Scooter or our Heavy Duty Mobility Scooters for more product options. Thumb Lever Controls- the left thumb lever controls the reverse and the right controls the forward motion. The simple use of pressure determines the speed of the scooter and releasing the level causing the scooter to automatically stop. It comes equipped with a horn and electromagnetic brakes.